First, thanks to everyone that voted on what desserts they wanted me to post next. I’m actually really excited this recipe won. I figured anything combining chocolate, peanut butter, cheesecake, and Reese’s peanut butter candies had to be fabulous, and it didn’t disappoint. I always photograph my food before tasting, and my first intent was to just have a bite and then start posting. Then one bite led to two, and before I knew it, the whole slice was gone. So just be warned, this cheesecake is addicting. And like all cheesecakes, it takes a good amount of time to make, so be prepared for a fair amount of prep before starting. Also, this needs to be done the day before you actually need it since it takes about 6 to 8 hours in the fridge to completely set. The cheesecake itself is actually super easy to make, just a little time consuming cause you have to make the crust then let it cool. Bake the cake then let it cool. 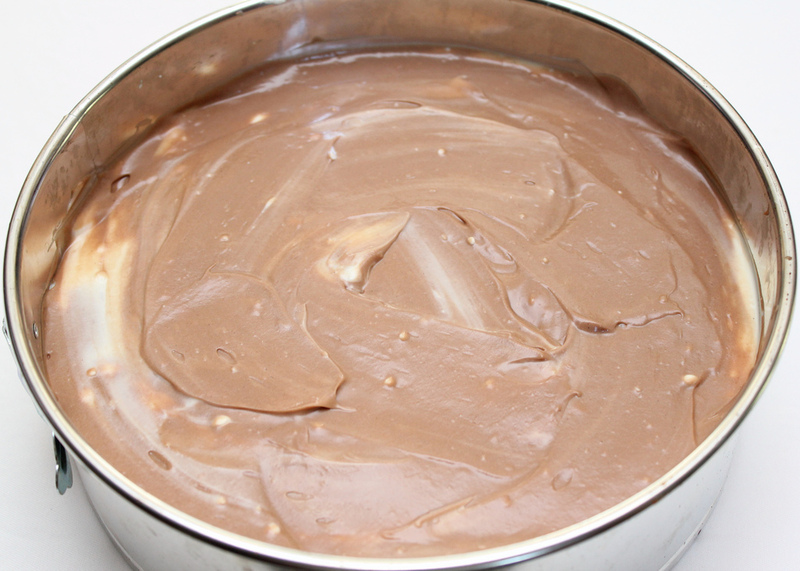 Finally add the fudge and the peanut butter candy and then refrigerate. So there are just a bunch of steps, but overall the recipe is not complicated. And the cheesecake itself is awesome, tastes just like a peanut buttercup with a creamier consistency. It really is to die for!! 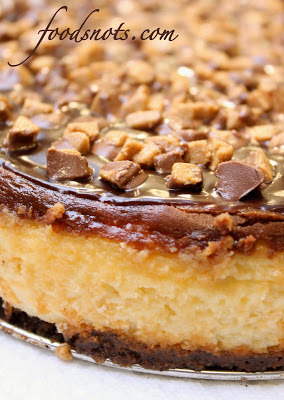 The perfect balance of peanut butter, chocolate, and cheesecake. Enjoy!! Preheat the oven to 375 degrees. In a medium bowl combine the graham cracker crumbs, chocolate cookie crumbs, and melted butter. Press the crumbs firmly over just the bottom of an 8-inch springform pan. Bake for 6 to 8 minutes. When the crust is cool, spread the peanut butter in a circle in the center of the crust. (You may soften the peanut butter for 30 seconds in the microwave to make it easier to spread.) You don’t need to spread the peanut butter to the edge, leave about an inch margin all around. You’ll need two separate bowls for the two fillings, one larger than the other. In the larger bowl, with an electric mixer, beat together the cream cheese, eggs, sour cream, sugar, and vanilla until smooth. Remove 1 cup of the cream cheese mixture and pour it into the smaller bowl. Add the chocolate syrup to this mixture and combine. Pour the large bowl of filling into the pan and spread it evenly over the crust. Pour the chocolate filling onto the other filling and spread it out. Using the tip of a knife, swirl the chocolate into the white filling beneath it. A couple of passes should be enough. Lower the oven temperature to 350 degrees. Bake the cheesecake for 70 to 80 minutes or until it becomes firm in the center. Remove from the oven and allow it to cool. 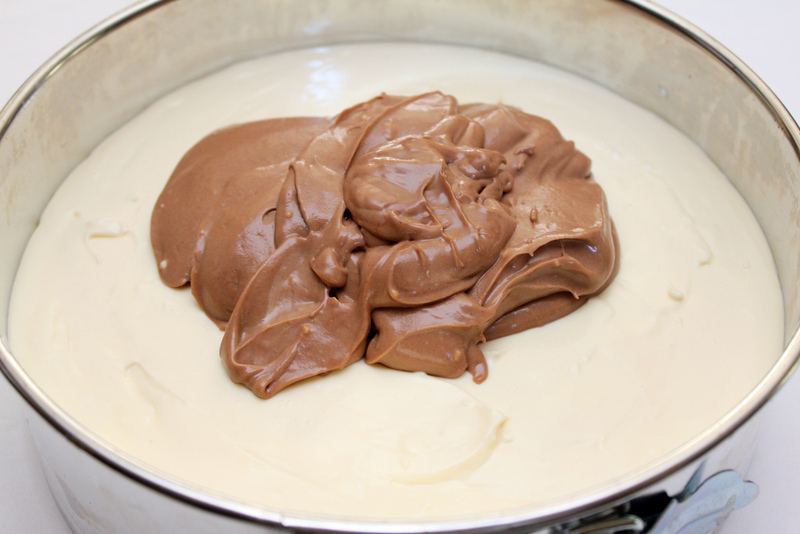 When the cheesecake is completely cool, soften the fudge topping in a double boiler or the microwave for about 45 seconds, then spread it out evenly over the cheesecake. Be sure to cover the entire surface of the filling. Unwrap the peanut butter cups and chop them into small chunks. Sprinkle the peanut butter cup pieces and any crumbs over the top of the cheesecake. Chill. Slice the cake 5 times through the middle to make 10 slices.